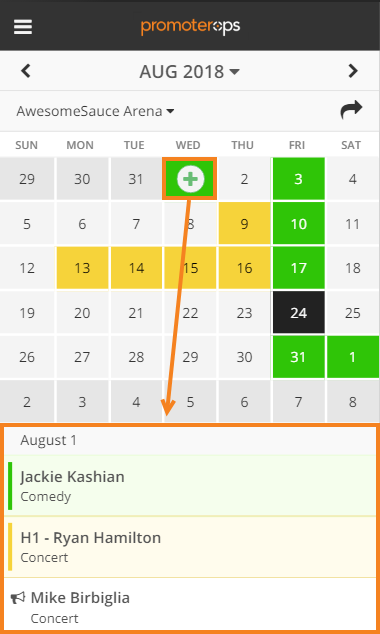 The mobile calendar view allows users to quickly see which dates are available and which are not. Please note that you can only view a single calendar at a time when using the mobile calendar. Grey: There are no events or blackouts on this day. Days within the current month will be a lighter grey than those for the previous or next month. Yellow: There is at least one hold of any rank on this day. 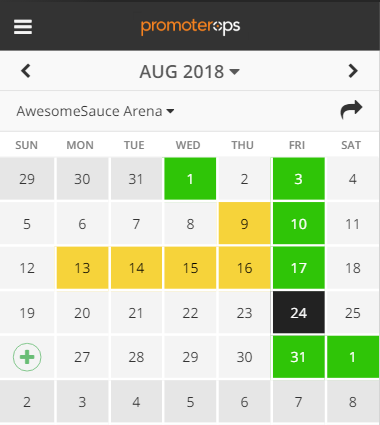 Green: There is at least one confirmed date on this day. There may also be holds. Black: There is a blackout on this day. There may also be confirmed dates or holds. To move between months, tap < to go to the previous month or > to go to the next month. Tap the name of the currently displayed calendar. 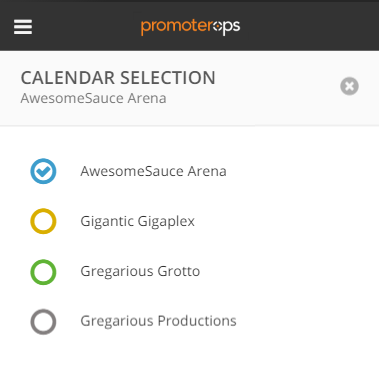 Tap the name of the specific calendar you want to display or an External option from the list. Tap the share icon to the upper-right of the calendar page. 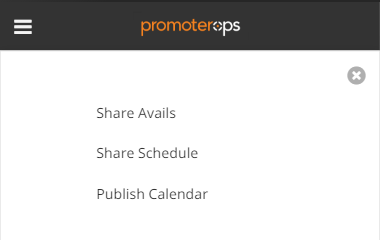 You can choose between the Share Avails, Share Schedule, and Publish Calendar options. For more information on sharing your calendar, please refer to the Sharing Avails and Schedule and Publishing Your Calendars articles. Tapping on a specific day on the calendar will display all the dates currently booked on that day.